A budding young football star from the Western Isles has reason to celebrate after being called up to represent her country. Lewis teenager Rachael Johnstone joins an array of talent from some of Scotland and the UK’s premier football teams after being selected to represent Paul Brownlie’s Scotland Women’s U16 side in next month’s triple bill in Portugal’s Algarve. Rachael, 14 and a fourth-year pupil at Sir E Scott secondary in Tarbert, is set to take part in the tournament in February, as the Scotland youths face tough opposition in the form of the Netherlands, Portugal and Germany. Rachael said: “I am really excited. It is going to be a new experience against some stronger teams. I am working hard for it but I think I am ready for it. Paul Brownlie has named his #SCOW16s squad to face the Netherlands, Portugal and Germany in a Development Tournament in Portugal. The Balallan resident has also dabbled her hand at training with some of Scotland’s elite footballers, partaking in training with giants Celtic before attending the national U16 training camp in Aberdeen last weekend. She added: “It has been a really busy week but it has been really good. I learnt so much being away at the training camp and training with Celtic and all the girls have been really nice, so I got on really well with everyone. In order to attend extensive camps and matches off the island, Rachael Johnstone has had to rely heavily on her mother Rhona to get her to and from venues; however, she shares the delight of her daughter and says she wouldn’t change it for the world. Mrs Johnstone added: “The school have been really supportive. They are just delighted she is doing so well. “It is an important year for her at school with her nationals coming up but the school have been great and the SFA have been really supportive as well. They insist that they take school work away with them for training camps and tours. 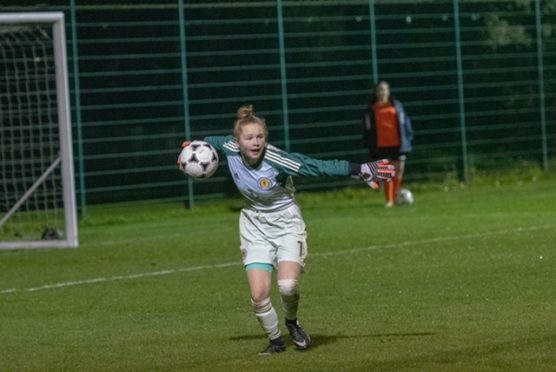 The Lewis and Harris Womens FC goalkeeper is set to add to her two caps having previously represented Scotland U15s versus Wales, and taken on Poland with the U16 side last year.